Today my kiddo's are strutting their stuff on the "Runway" to show off MadeIt's new pattern line, the FOLD collection. It was inspired by the Japanese art of Origami, which is a lot of fun! 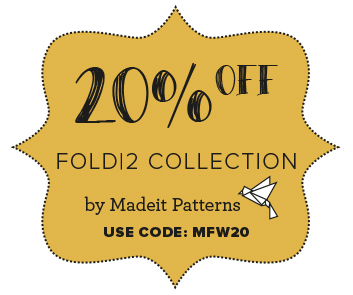 Besides a chance to win (more info about that farther down), you can get 20% off MadeIt patterns during Fashion Week, which ends REALLY soon, so totally take advantage! First off, we see Jude modelling the Kite Fold Tee and Book Fold Trousers. Don't forget the rocks. He was determined that they were part of his "look". The Kite Fold Tee is easily made using scraps, which I LOVE. The bicycle fabric is from Phat Quarters (one of my absolute favorite shops). Then I was able to use some of my remainding scraps of solid yellow and St. James stripes, stuff I was given in a knit off last year. The Book Fold Trousers are made from Stretch denim I got from Joanns, along with those super cool snaps. I love all the small details in these pants. The asymmetrical closing to the darts to the welt pockets. They're rather awesome. I did shorten Jude's length cause this kid is more torso than legs, which is the total opposite of my other kids. I think he's got the "serious" face down. 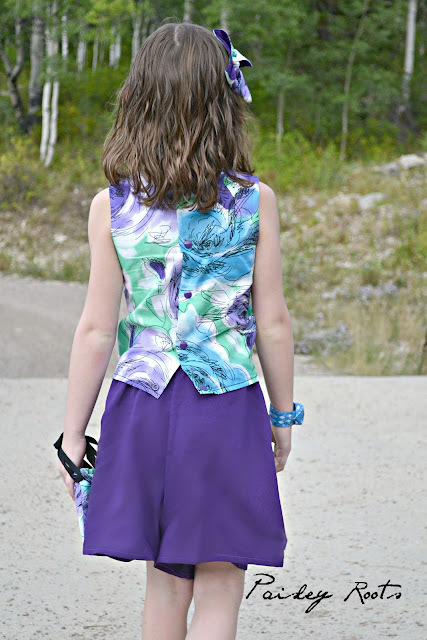 Now Zoe, was given "runway" advice from her older sister. Apparently this is how they interpret the Runway walk from watching Project Runway? Whatever it is, it's cracking me up. We started off with the Petal Fold Playsuit and used the Petal Fold Playsuit Supplement for Zoe's look. You need both of them to make this. I have no idea what the fabric I used is since both have been in my stash for what feels like years. And instead of making one big pleat in the middle, I did two small ones in the sides of the front. Any idea which origami animal she's kissing?? Her accessories were made using Origami tutorials. We had gotten this book a while back, so the kids have been in heaven making little origami creatures to put all over the house. We used the tutorial in that to make Zoe's butterfly hairbow. Then I used this tutorial for her little purse. My sister Brittany always makes them origami dollar rings, so we made a ring and bracelet too. So now that we've had our walks down the runway, onto the giveaway stuff! 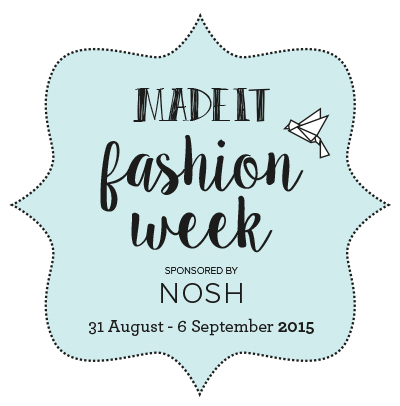 Each day of Fashion Week, MadeIt is giving away one pattern of the FOLD collection. To enter, you have to answer a question on Facebook or Instagram about the posts that went up that day. First one that answers correctly wins! So make sure to check out the other posts! And if that wasn't enough, Nosh Organics is giving away 3 - €50 vouchers to spend in their shop! To enter that all you need to do is comment on the post tomorrow! I love those pants! The star denim, the snaps, it's all perfect! Hahaha those GIF´s hahaha! Seriously, their innocence is so precious <3 And another fan of those pants here, star denim is just wow! I like so much the outfit you made for your son! The combination of fabrics is so good, and the stated denim is fantastic! The animations are brilliant!!!! 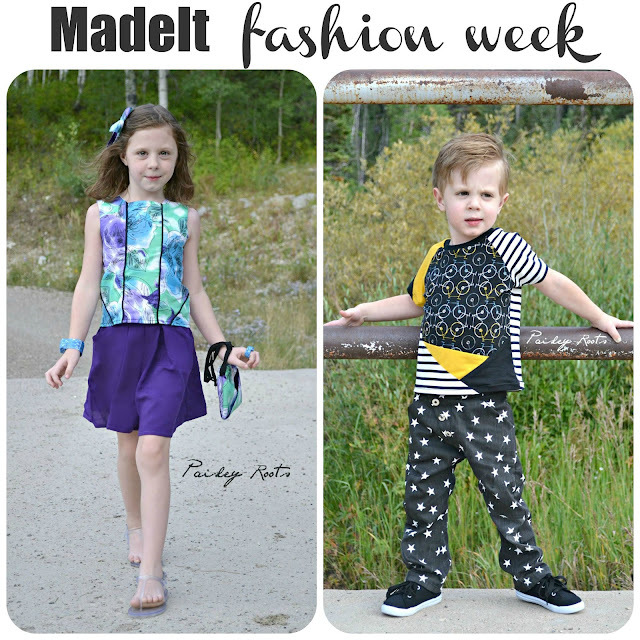 Love those star pants, and those catwalk struts! Love the pants! The star print is awesome. Really love your kite tee too! And that runway walk is the best... it cracked me up! She's definitely in! I love those GIFs!!! Two little supermodels, ha ha ha! Cute! Love both your outfits so much (and that cute bag is perfect), but I think those star pants are my favorite! 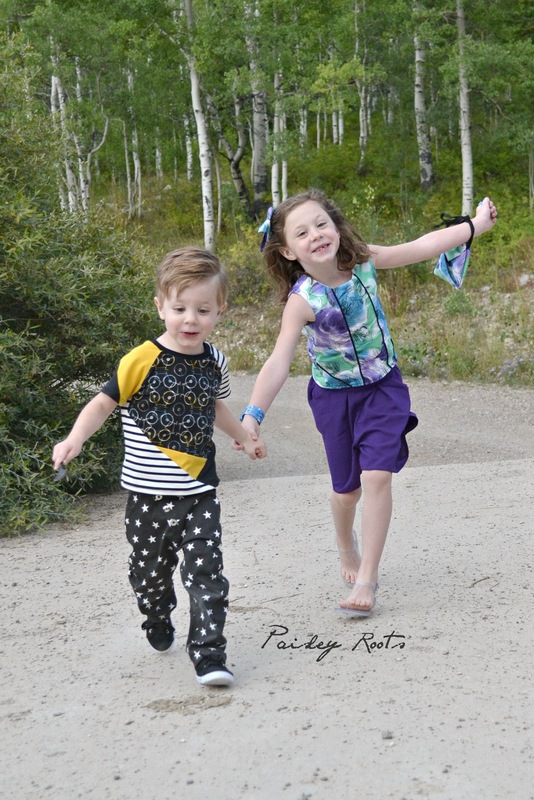 These childrens clothes are awesome and the fabrics too. Great models. Those GIFs are so fun! Great looks! Your animated GIFs crack me up. Love them. Both outfits are fabulous. But the book fold trousers are my faves. Why can I never find fabric like that? It is perfect. Your son is a little rock star in that outfit. 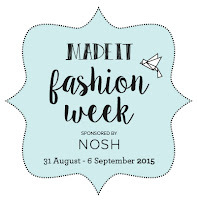 You did such a good job <3 Thank you so much for being part of Madeit Fashion Week. hahaha very lovely and cute kids. Lots of love for these kids, They are very smart.